One of the best things about blogging is being able to meet a lot of new people and make a lot of friends. I am able to visit gardens all over the world in a daily basis, and learn so much from the expert gardeners that take care of them. 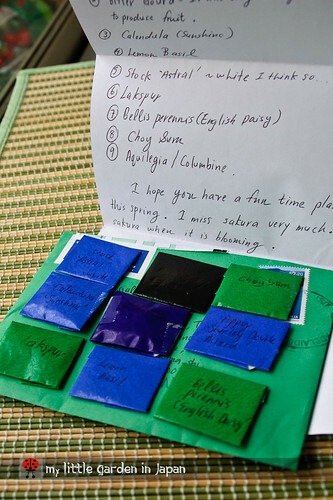 This past week I got a package with some seeds from my dear friend Diana from Australia. She has a blog called Kebun Malay-Kadazan girls. She has a very beautiful garden and gives a lot of great advices about growing your own food. I got the seeds as part of a contest she hold on her blog for seed week and as part of her participating on the project save the Bees. I was very lucky to be one of the winners. I got some poppy seeds, choy sum, basil, stock and others. I will be sure to prepare them as spring comes. Thank you very much Diana. I will take a lot of care of the seeds and keep you posted on how they develop. 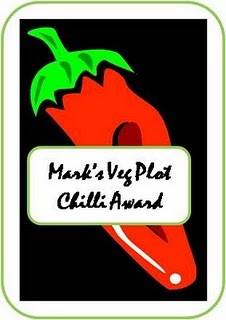 I also was very honored in receiving the Mark's Veg Plot Chilli Award from my friend Mark from England. He has a blog named Mark's Veg Plot with fantastic advices on how to take care of your home vegetable garden. We have exchanged some mails, I was fortunate on helping him making tortillas, and got some good advices in return. Mark’s award makes me feel specially privileged because it is the first time he has ever give such distinction and also because he only granted it to four people. Thank you very much Mark, I feel much honored. Also, I was very flattered that I have being receiving a lot of stylish blog awards from several gardeners. I understand the stylish blog award works more as a recommendation, but I feel very proud that they consider my blog to be good enough to merit that thumbs up. I believe they consider carefully who to pass it on, and it feels great they think my blog to have such value. Thank you very much, I really appreciate you picking me. It is great how many people you get to know while online. I hope I get to know every one much better and that I get to make many more friends. Thank you very much everybody for being my online gardening neighbors. I apologize for my week without posting. I got sick this week and had to rest in bed a couple of days. It was just a cough, but it knocked me down enough. Now I am fine, and hope fully I will keep posting regularly. Sorry to hear that you've been ill, there's lots of bugs going around here at the moment. Congratulations on all your awards, very well deserved. Hi Fer; Sorry to hear you have been unwell. I hope there is someone there to take care of you when you need it, just as you lavish so much love and care on your plants when they get sick! What do you know about the legal aspects of international seed-swapping? I've always assumed that it is not allowed / advisable. In the UK (being an island nation) we are always aware of the English Channel's potential for blocking the ingress of potential diseases! Congratulations on your awards Fer! Glad your feeling better. A very nice post! Congratulations on your seeds, and your awards! Happy you are recovered and able to post again! You do have a lot of friends and some fine awards. Congrats and glad you are getting healthy. How wonderful to receive so many seeds from Diana. The sunflowers seeds she gave me in Dec are blooming. They appear in my current post. Very clever of you to ACCEPT the awards in this manner. Glad to know you are well again. Welcome back to the land of living! Fer. You look to have been recovered. Actually I also suffered from high fever with vomiting through last weekend. Now we've seen a new type flu epidemic in Japan so we still have to pay attention even after recovery. Congratulations for your awards! I believe your blog deserve them! Now your cough is gone, hope you are able to keep it at bay. Sorry you've been ill Fer and glad that you are feeling on form again. I too got some seeds from Diana that I look forward to planting. I did wonder whether they would be allowed through the post but Diana clearly marked the envelope SEEDS and they arrived without a problem. Myabe plants would be more of a problem than seeds with respect to disease. Congratulations on all your awards, Fer! Excellent job. Also glad to hear that you are feeling better. Congrats on the awards fer, a sign of how much people enjoy reading your blog and much deserved. Sorry you've been ill, hope sowing your new seeds gives you a boost. Congrats on your various awards Fer, Im sure you deserved them! Take care of yourself and get well soon! Dear Fer, I am so sorry to read that you have been unwell and do so hope that you will be back to your normal self soon. You are so right that it is wonderful to be able to make connections with gardeners across the globe through the magic of the internet. The dialogue and diversity of ideas is truly inspiring! Thank you very much! I feel much better now. Luckily I didn't got sick too badly. But I did slept through a couple days. I had notice they had a bunch of sick people here in japan lately. I think is because the roller coaster of temperatures we had. We even finally got snow, but I was to sick to enjoy properly. Mark ~ I know Japanese customs to be quite strict in many aspects, but somehow I have not had problems with seeds so far. Probably because is a small quantity. As for other countries, from what I have seen it variates a lot depending on the location. If I had sooner known how good blogging was, I would have done it earlier. I feel pretty much the same way about it as you. And I am glad I started my blog last year. friendship, even virtual, is beautiful thing, and when you too meet the people crazy about the same things like you - really wonderful. i too exchanged some seeds with my new blogging friends. Congratulations! Making friends is what I like about blogging too. Your gardening experience is so different from mine, your blog has been fascinating reading. So glad to hear you are feeling better Fer. Congratulations on your awards - they are well deserved. 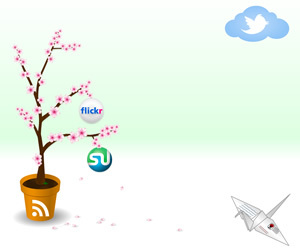 Also, I'm very glad to have "met" you here in the blogosphere - thanks for being my gardening neighbor! Congratulations on your award! It is so nice to know that your writing is appreciated. I love the friendship part of the blogging. It was never my first goal when I started my blog, but it is one of the best things about it. I am glad you feel much better now. Flu is easily spread during winter. Congratulation on your awards. Hope you have a fun time with the seeds this spring. Thank you very much! I am feeling much better now.